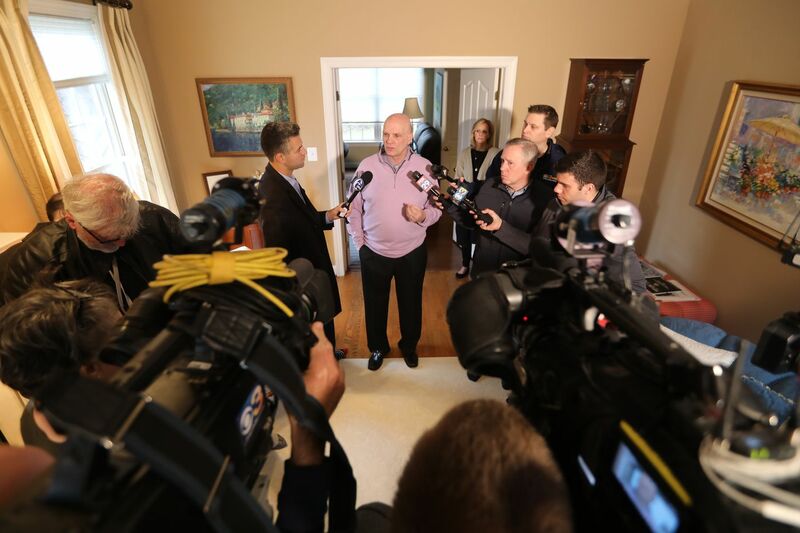 Phil Martelli hosted the media at his home in Media on Thursday. The local TV stations, a few newspaper folks, and Howard Eskin had assembled in Phil Martelli’s family room in Media on Thursday morning. Martelli apologized for the rain. He wore a purple sweater -- no Hawk colors this day. Martelli didn’t invite the media into his home simply to go off on the school that had employed him as head basketball coach for the last 24 years and fired him this week. All elements of the local media had wanted to hear from him, and where was he supposed to hold a little news conference? Villanova? What Martelli seemed to really want to get off his chest: What, in his mind, St. Joseph’s basketball was about for the last 24 seasons. “It wasn’t just about getting jumpers up," Martelli said of what he tried to instill in his players, how the only team rule always was to be on time, but the expectations went further. He joked about learning to text, that he texted players a thought every morning. But he didn’t want a team full of players looking at their phones as their sole means of communication. “Life is a participation sport," Martelli said, adding that he wanted to return recruits to their parents as adults. The message wasn’t much different than what Martelli expressed in a phone interview with The Inquirer the previous day. While he was at Monday’s Coaches vs. Cancer breakfast, he got a text asking him to meet with St. Joseph’s president Mark C. Reed and athletic director Jill Bodensteiner at 1:30 that day, he said. That said, Martelli knew he was being evaluated this season, and he knew this season had gone way south. He knew the injuries that had done in the two previous seasons couldn’t be put up as the problem this time. The season went south before injuries hit. Phil Martelli's last season at St. Joe's went south before injuries hit. He pointed out that St. Joe’s won two of the previous five Atlantic Ten championships, and no other school could say that. (St. Louis this year, Davidson last, Rhode Island in 2017, Hawks in 2016, VCU in 2015, Hawks in 2014). Hawk fans who wanted change will point to different stats. One NCAA Tournament win in three appearances since 2004. He realizes that it takes a school to tango, that, as Martelli put it, he’s a 64-year-old coach who got fired. “I’ll be juiced, and I’ll be fired up,” he said. Phil Martelli hosted a press conference at his home on Thursday.